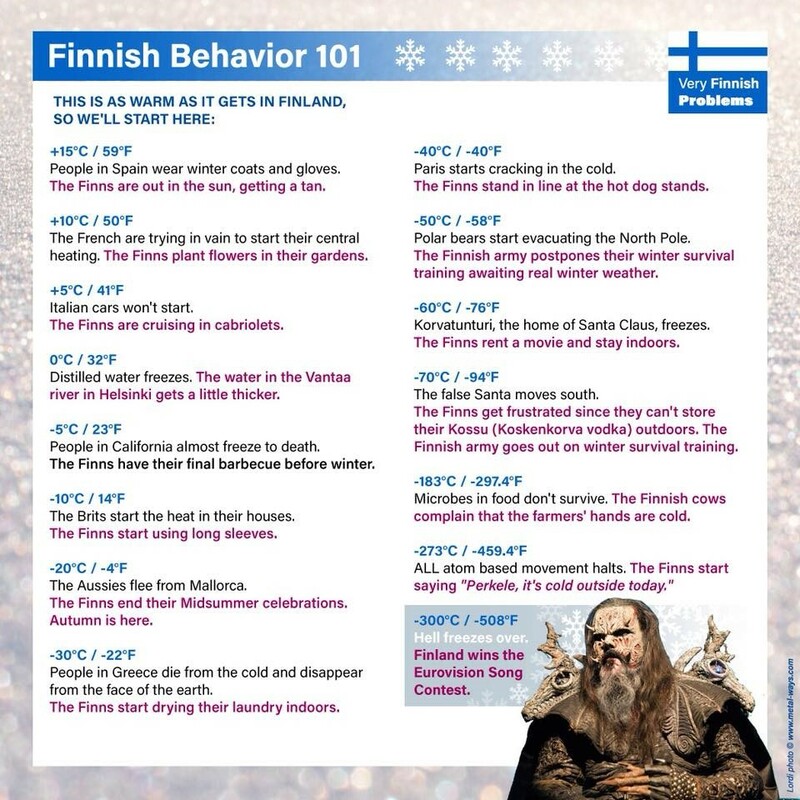 Although the above “lesson” in Finnish behavior might exaggerate a bit or a lot actually, one thing is certain: Life in Finland does not stop when the temperature drops below zero! The first time I came to Finland, it was -25 degrees Celsius and I was NOT prepared for it! But somehow, I survived, even in lower temperatures (-38 Celsius!) even though I come from the country that people “die and disappear from the face of the earth” in -30 degrees according to the image above! And so can you! Survive I mean! Even if you come from a country where temperatures rarely go a few degrees below zero, I can assure you that if you learn how to dress smart, then you should be able to enjoy the beautiful even though really cold Finnish winter! Invest in some good outwear! Before coming to Finland, it is good to invest in buying a really good jacket, snow boots, ski pants and good gloves and mittens. They might be more expensive than regular outerwear, but it is worth it and remember that in most cases, the better the quality, the longer they will last and the warmer you will feel! Wool is your friend! Woolen socks, woolen mittens, woolen sweaters! You name it! Wool is perfect for all conditions: rain, heat, cold, because, among others, it is very durable, water resistant, breathable and great insulator. So, if you have accidentally got your feet wet by the snow or rain, the wool will protect your feet from getting cold. By absorbing the moisture, which is what makes our body feel cold. Layers. Even though many people might think that a huge and thick sweater would be a good option for really cold temperatures, it is actually multiple thin layers that will do the trick in these cold temperatures. The reason is because they help you preserve your body heat, while allowing your body to breath as well. How does it work? Well, the inner layer absorbs the moisture, the middle layer insulates your body from the cold and the outer layer further protects you from the weather elements such as wind, show and rain. As a base layer, it is best to avoid cotton and opt for wool again, especially merino wool, which does not irritate the skin. As a middle layer, it is best to choose fleece or wool material and as an outer layer, go for a waterproof and wind resistant jacket. Moreover, if you get sweaty, it is easier to remove a couple of layers of clothing, which would not be the case if you were wearing only a thick sweater. Listen to your body. Some people have the tendency to sweat more than others or feel warmer most of the time. If you are one of those people, then you are a lucky one, because you will probably need less clothing layers. However, if you are one of those people like me, who always have cold hands and feet, then you probably need to put on a few more layers of clothing. But how many layers are enough? As a general rule though, I would say that 3 to 4 layers should be enough for -20 temperatures, but everyone is very different, so what I would suggest, is dress up warm enough and go for a walk in your neighborhood for about 20 to 30 minutes. If you felt sweaty, then you should remove a few layers and if you felt really cold, then it is easy to come home and add more layers until you feel good enough to walk for about half an hour. Dress for the occasion. That is if you plan on staying outside for a long period of time, then you need, of course, to wear more layers than if you are driving from point A to point B. Moreover, if you are brave enough, have winter tires for your bike, helmet, (safety is very important in these conditions!) and you plan on biking during the whole winter season, like I hope to do so, you need to keep in mind that you might need less layers in your legs and especially in your upper body because, you will sweat while riding your bike and the water of that sweat makes your body feel colder. However, it is important to have wind resistant jacket, gloves or mittens, pants and beanie to protect yourself from the wind. Don’t dress up like an onion with the first sign of winter! Listen to your body of course, but don’t wear your most warm jacket and all the layers you can find, when the temperature is a few degrees below zero. First of all, because you will probably get sweaty and as I mentioned above sweat can make your body feel colder. What is more, since the temperature will probably drop even lower in the next months, it is better to prepare your body for that by keeping your warmest jacket for that time, because after a while you can get used to the cold. However, if you really feel that cold, it is best to wear a few more layers over your regular clothes. Winter is a state of mind! I say that jokingly to my friends many times but there might be some truth to it. If everyday you are dreading of how you will go outside and keep thinking of how cold you will be, then you will probably feel colder than you should. Psychology can affect a lot how your body perceives outside weather conditions, and therefore, obsessing about the cold temperatures will only make things worse! I know it will not be easy because I still do think how I will cycle in -25 degrees every day, but once you made it a couple of times, you will get used to it and you will also feel really proud of yourself for surviving under those circumstances. How are you surviving winter in Finland so far? Do you have any more tips? Please, share your thoughts and ideas in the comments below! Great post Antonia! I do cycle in this weather, too, and I also did it the whole last winter, so don’t worry about it, you can do it! Also, if you feel comfortable with the cold, I suggest going skiing, since it is basically free and a ton of fun!